Before I started working from home, I worked for a mortgage company in an office right next to a Starbucks. Every weekday for a year, I bought a Grande Caramel Macchiato for $4.55 and a boxed lunch from a deli for $6.95. I thought that was a bargain. But at the end of the year, I added up my lunch money and discovered I had spent — drumroll — $1,288.50 on coffee and $1,876.50 on sandwiches. Spending $3,165 a year while at the place where you're supposed to be making money is ridiculous, but I wasn't alone. A survey by the placement firm Accounting Principals shows American workers spend, on average, more than $1,000 on coffee a year and nearly $2,000 on lunch. If you spend $3,000 yearly on coffee, lunch or other workplace treats, that's $250 per month. If you invest $250 monthly and earn just a 5 percent return on it, after a 30-year career you would have saved $208,065. Manage to earn 10 percent on it over the same period of time, and you'll end up with $565,122. Wouldn't that make a nice addition to your retirement savings? The best way to save on lunch is the most obvious — make your own lunch. More on that in a minute, but if you're going to eat out, you can save a ton by buying discounted gift certificates ahead of time on websites like Restaurant.com. Buy the gift certificates online, and then print them out at home. Or, simply display them on your mobile device. Discount websites like Groupon and LivingSocial sell similar dining deals. Here is an extra tip: Make any purchases from Restaurants.com or sites like Groupon and LivingSocial via a cash-back portal. They pay you to shop online by giving you a percentage of your purchase cost back — for example, via a check or PayPal deposit. Find out more about savings on dining out in her full article, "12 Ways to Slice Your Restaurant Bill in Half"
Lunch with co-workers is about more than food — it's fun. To keep the social experience and save money, my co-workers and I organized weekly potlucks. One day a week, everyone brought in one dish, and we all ate lunch together. The dishes I made cost less than my Starbucks sandwich, and there was always enough left over for everyone to take a plate home — so I got two meals for the cost of one dish. Make extra: When cooking dinner the night before, I made enough for an extra meal. All I had to do was toss the leftovers into some Tupperware. Make your own salads: Salad mixes at my grocery store cost $3.50 apiece and make about two decent-size salads, so each is $1.75. I buy fresh ingredients and make my own to save money. For example, I spend $4.50 to make at least six large salads, which breaks down to 75 cents each. Plan ahead: Now that you're brown-bagging it, you'll need to buy more groceries. But if you plan ahead and shop the sales, you'll save time and money. WebMD has a sample grocery list for a week's worth of lunches under $5. Turn a desk drawer into a pantry: Sometimes I just didn't have time to make my lunch the night before. So I stocked up on food in my office — things that wouldn't go bad right away, like canned soup, nuts and dried fruit. Mostly, I bought my coffee elsewhere because I didn't like the taste of the free coffee in the break room. But when that got too expensive, I bought a large container of Coffee Mate French Vanilla Creamer to use in my coffee. I figure that by drinking the free coffee instead of buying that Caramel Macchiato, and spending about 5 cents a day on creamer, I saved about $4.50 a day, or $22.50 per workweek. Another thing I could have tried was brewing gourmet coffee at home and bringing it in a thermos. Just as it's easy to forget how little amounts add up, it's also easy to forget to put those savings to work. If you manage to use the techniques above or others to save money, don't fritter it away. If you save $200 a month by bringing coffee and lunch from home, have that much automatically transferred from your checking to your savings or investment account. For ideas on how to build on those savings, check out "How to Get Stated Investing If You Don't Have Much Money." 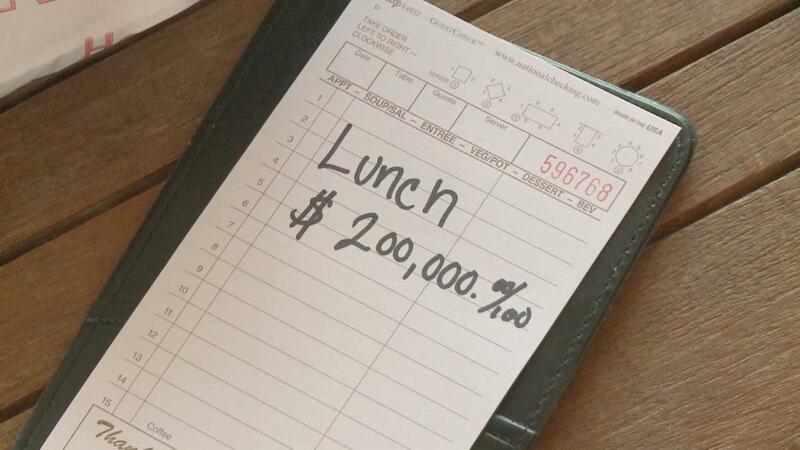 How much do you spend on coffee and dining out for lunch? Share your thoughts in the comments section below or on our Facebook page. Are you disgusted by what you're forking over in bank fees? 11 countries where college is cheaper than in the U.S.